NEW YORK (TheStreet ) -- Gold prices were lower Thursday after the Chicago Mercantile Exchange raised the amount of money it costs to buy a speculative gold futures contract and after gold spiked to a record of $1,817.60 an ounce in overnight trading. Gold for December delivery was down $18.20 to $1,766.10 an ounce at the Comex division of the New York Mercantile Exchange. The gold price has traded as high as $1,817.60 and as low as $1,753.50 while the spot gold price was losing $32.50, according to Kitco's gold index. Silver prices were down 48 cents to $38.84 an ounce. TheU.S. dollar index was lower at $74.57 while the euro was up 0.17% vs. the dollar. The CME finally stepped up and raised margin requirements on gold, that is the amount it costs to buy an 100 ounce gold futures contract, after the metal skyrocketed more than $200 in 3.5 weeks. It now will cost $7,425 to buy a speculative contract and $5,500 to maintain it, both represent a 22.2% increase. The CME deployed the same technique with silver in May when prices skyrocketed to almost $50 an ounce, which then led to more than a 30% decline in the metal. If the same were to occur in gold, prices would dip to under $1,300 an ounce. However, gold seems to be shaking off the margin requirement as cries for a safety net as the Dow Jones Industrial Average nears bear market territory. 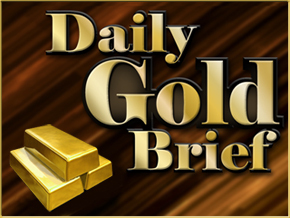 "We noted at the start of the week that a margin hike could dent the bullish sentiment in gold," says James Moore, research analyst at FastMarkets, who thinks, along with other traders, that gold could benefit from a period of consolidation. "But, with little in the way of positive news in-sight and threat of default/downgrades continuing to overshadow markets gold will likely remain underpinned and could potentially extend to fresh highs." Scott Redler, chief strategic officer for T3Live.com, says that it's hard to buy gold at record levels, his favorite vehicle is SPDR Gold Shares , but says "I still expect significant upside due to continued demand ... It looks like gold is in the last stage of a parabolic move up to the $2000 mark." Redler says not to chase gold's recent extension but that "every sale so far has been a bad one." Gold's frenzied rally has some long-time gold bugs worried. Legendary gold investor Jim Rogers has said that in the end of the gold bull run there will be a huge bubble in precious metals. "I don't know when that will be," says Rogers. "Most long term bull markets wind up in a huge mania, a huge bubble before it's over and this one will too. Someday, everybody will own gold. Someday, people will be walking down the streets checking gold prices in front-shop windows." When asked if gold's recent rally qualified as this huge mania, Rogers said it was "not enough frenzy yet, but it is getting very worrisome. I want to keep my gold another several years, but who knows IF this keeps up?" David Banister, chief investment strategist at ActiveTradingPartners says that gold "could see a final surge to $1,862-$1,900, but that should top it for a while." Banister foresees a multi-month correction that will have gold trading sideways with some big drops along the way. But for Thursday gold seems content still being a safe haven as even a $30 drop in the spot market doesn't counter act the massive three-week rally. Weekly initial jobless claims in the U.S., which fell to 395,000 last week, did nothing to calm jittery investors. Worries about the solvency of French banks and the country itself not to mention Spain and Italy are still resonating throughout markets, making gold the go-to asset. Gold mining stocks were mostly higher Thursday. Barrick Gold was up 0.64% to $49.98 while Newmont Mining was popping 3.58% at $57.81. Other gold stocks, Goldcorp and AngloGold Ashanti were trading mixed at $50.38 and $45.96, respectively. --Written by Alix Steel in New York. >To contact the writer of this article, click here: Alix Steel.